Wauseon’s Payton Albright catches a pop up in the first game of a doubleheader with Tinora Saturday. The Indians won 10-0 and 6-2 for the sweep of the Rams. Alexis Haury, serving as a pinch-runner for the Indians, scores in game one. 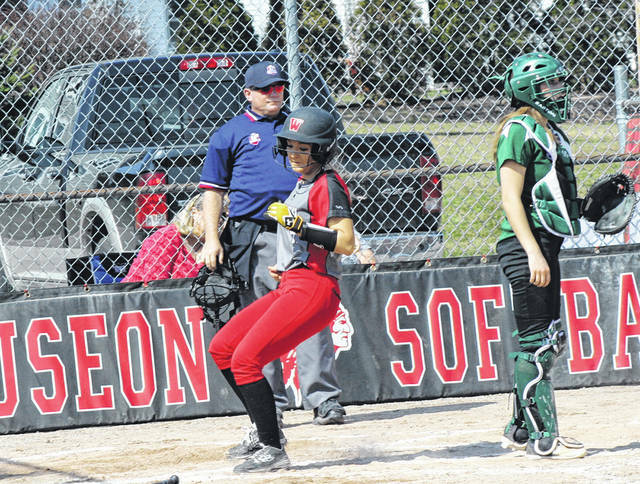 The Wauseon softball team was feeling the sunshine and nice weather Saturday, taking that time to have one of their best outings on the field in sweeping a doubleheader against visiting Tinora. The Indians captured a 10-0 six-inning win in game one, then topped the Rams 6-2 in a second game that was slated for five innings. Wauseon held just a 3-0 lead through three and a half innings of the first game, but they turned it on down the stretch. In the bottom of the fourth, they did most of their damage with two outs. After Autumn Pelok reached on a fielder’s choice which got Chelsie Raabe out at second, Payton Albright’s base hit put runners on first and second. Then, a Christina Norman bloop single scored Pelok, extending the Indian lead to 4-0. An Alisa Shelt double would bring in two more to make the margin 6-0. They added one more on Macee Schang’s RBI single. They did keep the momentum going in the home half of the fifth, also with two outs. Raabe singled to get it started, and moved to second on a misplay by the Tinora outfielder. This allowed Juli Spadafore’s single to bring her home, then Spadafore proceeded to second on the throw to the plate. Wauseon’s Alexis Haury came in to run for the Indians’ pitcher, scoring on a single from Pelok for a 9-0 Wauseon lead. The Rams stranded a base runner in the top of the sixth and the Indians ended the game via the run rule in the bottom of the frame. They did so with a RBI hit from Harlee Floss that plated Shelt. Shelt (2 for 3) paced the offense with three runs batted in and she also scored a pair. Schang (2 for 3) drove in two runs. The second game was a lot closer but the result remained the same. Tinora had cut the deficit in half, 4-2, with consecutive solo home runs – one to left field and the other to right – by Hanna Horn and Erica Rieke in the top of the fourth inning. However, in the bottom of the inning, Norman responded with a two-out two-run bomb to left to get back the runs with just one at bat left for the Rams. Macee Schang sealed it by striking out the side around a Sierra Salinas walk in the bottom of the fifth. She took home the win, allowing just two earned runs on four hits while striking out 12. 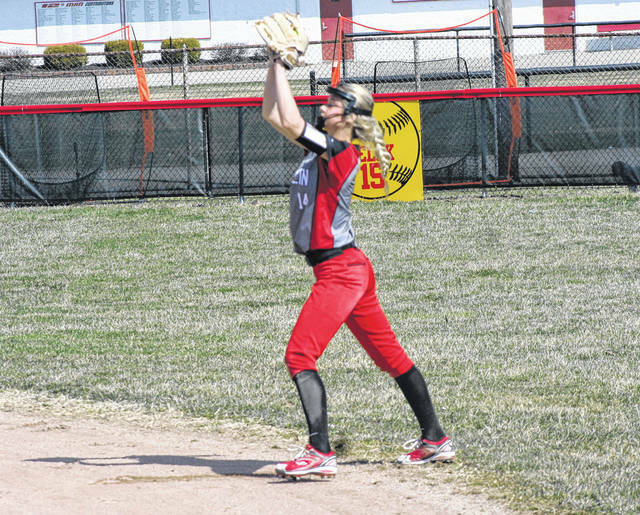 Wauseon, who also won at Pettisville 20-0 in five innings Friday, traveled to Patrick Henry to begin NWOAL play Monday and visits Otsego Tuesday.